There’s a good reason why humidifiers hold a high place on the nursery gadget list. Properly moisturized air offers a plethora of benefits for your little one. For example, your baby will have a healthier skin, the little honker will work better, and your baby will really sleep like a baby, and not give you those dreadful long night –trying-to-put-the-baby-to-sleep sessions. If the weather where you live is cold most of the time, a good humidifier will help you battle the consequences of the heating systems – the Dry air. What’s more, you can even save some money on the electric bill by lowering the heating because the warm mist will raise the temperature of the air. Want to learn more about the benefits of having a humidifier in your baby nursery, read on. Little noses are not happy when they have to deal with dry air. Your baby’s sinuses dry up and that causes discomfort and congestion due to flare ups. Even our nasal passages get filled quickly when the air is dry, imagine how fast that happens with a baby. However, if there’s a humidifier in the room, the warm mist will nicely moisturize the nasal passage walls and not allow the little honker to stay stuffed with secretion. Also, properly humidified air allows babies to clean from the leftover amniotic fluid, and start using their little lungs at full capacity. There’s hardly a more frustrating thing than watching your little angle suffer from a cold. We all know how we feel when we are down with a cold, which makes it even harder to watch our little ones suffer. And, since it’s not advisable to give babies cold medicine (antibiotics and cold syrups) there’s not much we can do, isn’t it? Well, not quite! You can help your baby feel better much sooner with a humidifier. Humidified air helps with congestion, and that is the most important thing to get rid of as soon as possible. The secretion that gets trapped in the nose is filled with bacteria and viruses. When the nasal passage walls are “slippery” from moisture, the secretion won’t be able to hold on, thus the recovery will speed up. 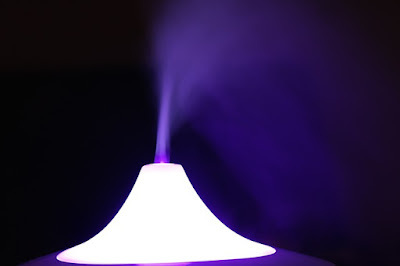 If you want to find out more about how humidifiers help with cold symptoms, and a plethora of other issues, (snoring, pollen allergies, headaches, and so on), both with babies and grown-ups, I recommend checking out the Humdifiergeek Guide. If you are a soon to be parent, then you don’t know how your newborn’s skin becomes dry once the little one gets outside the womb. The skin becomes dry and starts peeling. Don’t worry, that is completely normal and every baby goes through that acclimatization period. However, if your baby’s skin isn’t moisturized properly, it can become too dry and crack. Therefore, besides the creams you will use each day, I also recommend using a humidifier in the nursery because it will provide that extra moisture for your baby’s skin, and allow her to adjust to the outside world faster and more comfortable. For more information on how humidifiers help with dry skin, I recommend checking out the Leona Maurer Blog. As you are soon to find out, in the first week or two, your baby will still have some amniotic fluid left in her lungs. Normally, she will cough it up and start using her lungs fully, but, this will make her wake up during the night and it will make her nervous (and make you nervous as well). So, you can help her (and yourself) by “greasing” up her air ways a little. With a humidifier in the nursery, your baby will clear her lungs and nasal passages much easier and quicker. Plus, the light humming sound that humidifiers produce remind babies of the sounds they herd while they were in the womb, making them more relaxed. You know what this means? Better, deeper sleep! And, you know what this means further? Better, longer sleep for you and a happier mommy in the morning!